Penrith again relied on a dominant second half to secure a win at home, defeating Souths 18-14 in front of almost 16,000 fans at Panthers Stadium tonight. Just like last week against the Eels, the Panthers had to come from 14-0 down to grab the two competition points, with a Tyrone Peachey try just six minutes from full-time completing the comeback. The match never reached any great heights with both sides making sloppy errors and a total of 22 penalties halting any momentum. 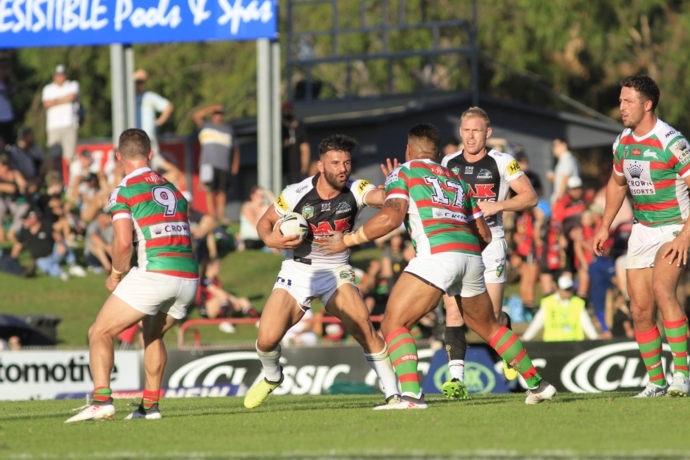 The Rabbitohs grabbed a 2-0 lead early through an Adam Doueihi penalty goal, and extended the margin to 8-0 when Cody Walker scored an exciting try in the 14th minute. Just before half-time, Damien Cook sprinted through Penrith’s line to put the Rabbitohs up 14-0, with the Panthers left to ponder another slow first half. “We’d prefer not to be in that position but credit to the players… the game goes for 80 minutes and we got it done again,” Panthers coach Anthony Griffin said post-match. Penrith managed to turn around their completion rate and weight of possession in the second half, finally getting on the board when Trent Merrin plucked an awkward Peter Wallace pass out of the air and reached out to score. The try was enough to shift the game in Penrith’s favour with Waqa Blake and eventually Peachey grabbing four-pointers to get Penrith home. 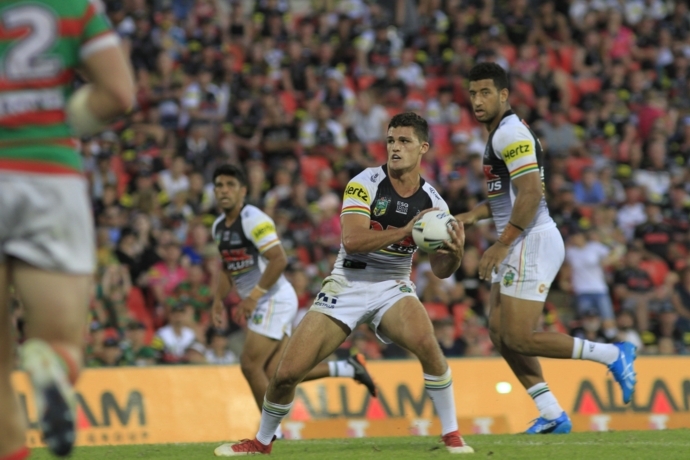 There were some nervous moments after the full-time siren when a missed penalty attempt from Nathan Cleary gave the Rabbitohs one final shot at Penrith, but the Panthers eventually shut the play down. Griffin said he thought Souths came out strong. “Souths brought a really strong performance today. They took a bit of running down and our guys did a really good job in doing that,” he said. Penrith take on Canterbury at ANZ Stadium next week.